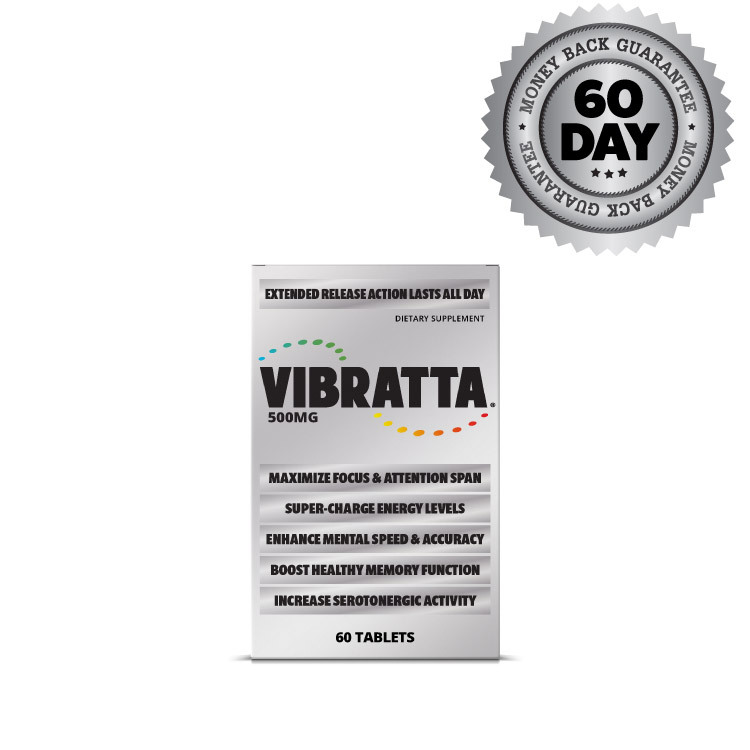 Over the counter Vibratta is indicated for people who have trouble focusing or paying attention, difficulty concentrating clearly, poor memory function, or daytime fatigue in the face of everyday stress. 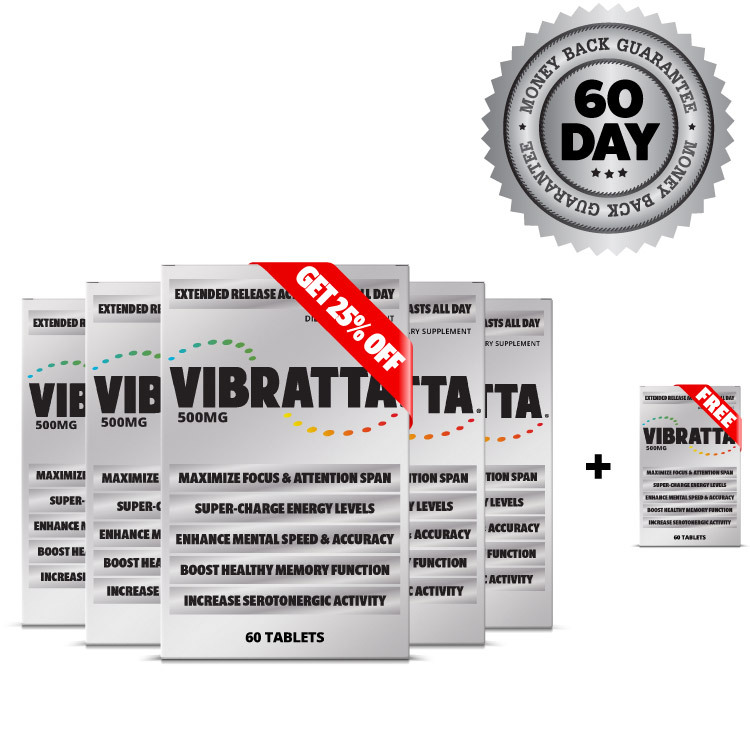 Vibratta works all day to rev up your energy levels, sharpen your cognitive abilities and help you feel more motivated without caffeine — activate your 7-Day Vibratta Trial right away to feel the difference for yourself. 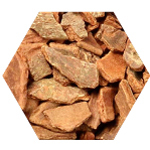 Act now and we will RUSH ship your 1-week Vibratta trial supply for just $4.95 S&H! You pay just $4.95 S&H to begin your 7-day trial and enroll in the Vibratta Wellness Plan. 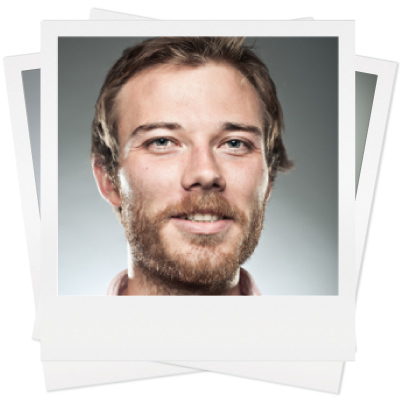 See complete trial offer detailsWe are here to help you stay on track with Vibratta! Act now and we will RUSH ship your 1-week Vibratta trial supply for just $4.95 S&H! Love the results? 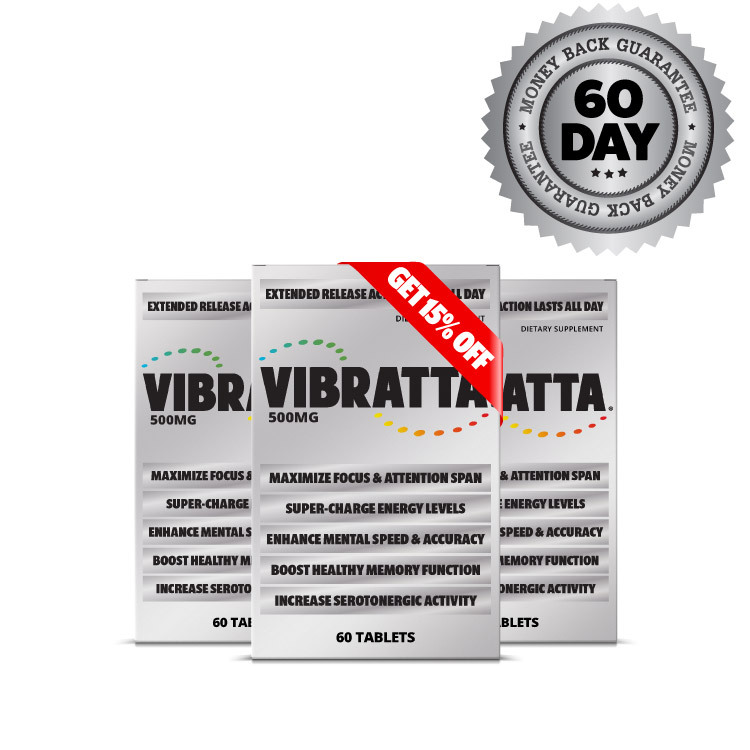 You'll be automatically enrolled in the Vibratta Wellness Plan on the 7th day and begin receiving one bottle monthly at the special 15% discounted rate of $34.95. No commitments required. Stop your refills at any time for any reason.. Everyday stress makes it difficult to keep sharp, focused and motivated in the face of life’s day-to-day challenges. With all there is to do from morning until night, you could be left feeling zapped of energy and robbed of motivation by day’s end. Discover how taking Vibratta (vih'BRAH'tah) first thing every morning can help you stay on the ball at work, school or at home with plant-derived stimulants and neurotransmitter modulators that are clinically proven to work. Jump to a section linked below or continue reading to learn how Vibratta maximizes focus and attention span, super-charges energy levels, enhances mental speed and accuracy, improves natural memory ability, and boosts serotonergic activity. 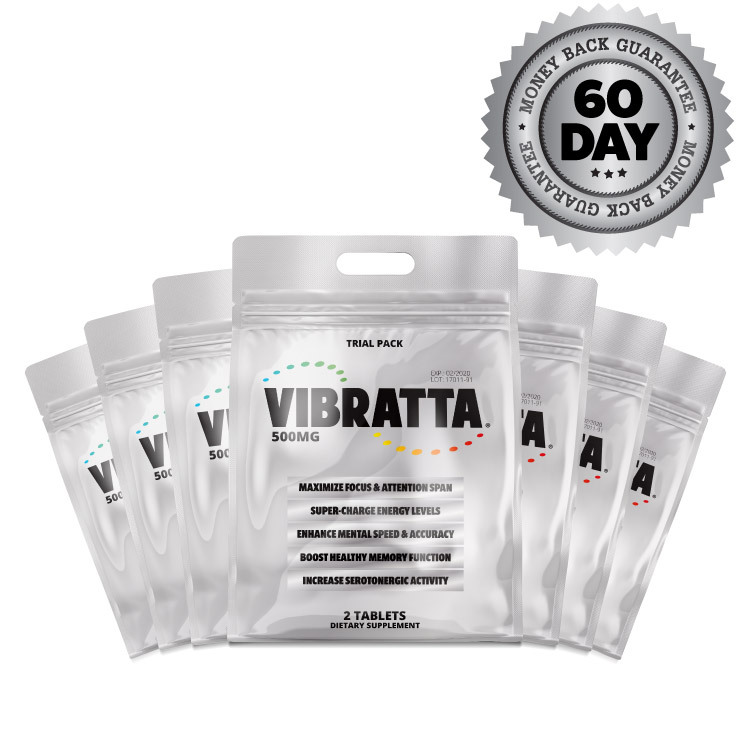 Best of all, Vibratta is natural and non-habit forming, so you can take it daily and stop anytime if you no longer need it! Order Vibratta today and see what supercharging your energy, focus and memory can do for your life! Vibratta is indicated for healthy adults and teens ages 14+ who experience trouble with focus, attention and concentration, poor memory function, or low energy caused by everyday stress factors. Vibratta does not require a doctor's prescription, but you should always consult with a professional healthcare provider before making changes or additions to your wellness plan. Not sure if Vibratta is right for you? Take the 1-minute Vibratta Wellness Quizlet to find out now! 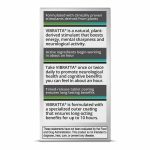 Vibratta is scientifically formulated using a blend of clinically proven natural stimulants and plant-derived neurotransmitter modulators that work to maximize focus and attention span, super-charge energy levels, enhance mental speed and accuracy, improve natural memory ability, and boost healthy neurological function. Vibratta efficacy is maximized through the use of co-factors. These are supporting ingredients that include other phytonutrients, essential vitamins, trace minerals and amino acids. 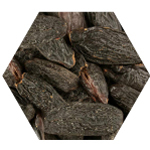 Co-factors either 1) amplify the effects of the primary active ingredients or 2) promote a similar action to the active ingredients in the Vibratta nutritional-herbal complex. Together they contribute to a broad spectrum of neurological benefits. 1) Bacopa and American Ginseng are natural neurotransmitter modulators that deliver stimulant-like effects by speeding up cerebro-electrical activity in the central nervous system. 2) St. John’s Wort and Arctic Root are natural neurotransmitter modulators that work by blocking the normal breakdown of serotonin. This promotes greater serotonin availability in post-synaptic neurons to enhance serotonergic activity, nerve-impulse transmission, and cell-to-cell communication. 3) 5-hydroxy-l-tryptophan (5-HTP) and Choline are precursors to the neurotransmitters serotonin and acetylcholine. Both ingredients act as building blocks and work to enhance neurotransmitter activity in pre-synaptic neurons. 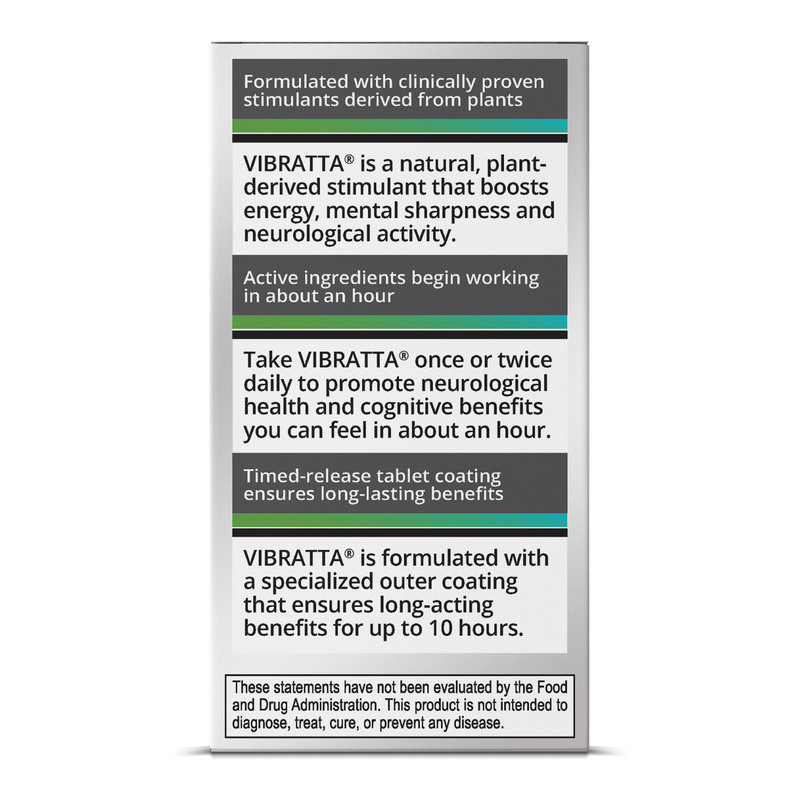 Vibratta tablets are coated using an advanced cellulose polymer technology to ensure tablets are broken down slowly and at the right time in the GI tract for maximum efficacy. 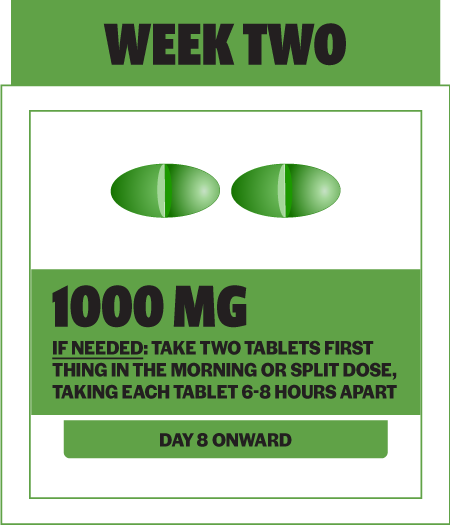 Benefits last up to ten hours per dose. 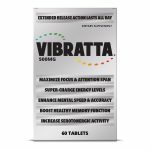 Cognitive enhancements and increased energy levels are evident for most successful users soon after taking Vibratta for the very first time — over 77% of successful users reported benefits in two weeks or less, according to a wide-scope user benefits analysis. Broad-spectrum effects that improve performance levels at home, work, or school may take a bit longer to show for some people than others, because everybody is unique. WIDE-SCOPE USER BENEFITS ANALYSIS CHART PROVIDED FOR INFORMATIONAL PURPOSES. 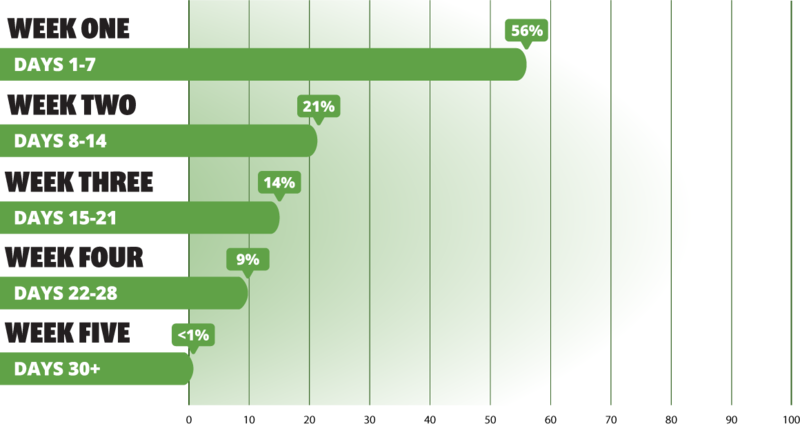 ONLY SUCCESSFUL USERS WERE SURVEYED TO OBTAIN AVERAGE ESTIMATES OVER A PERIOD OF FIVE WEEKS. THIS ANALYSIS IS NOT MEANT TO ACCURATELY PREDICT YOUR INDIVIDUAL RESPONSE TO VIBRATTA, WHICH MAY VARY. 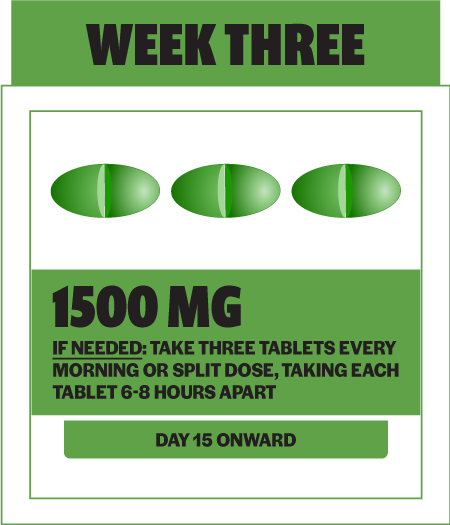 Chart analysis shows a smaller percentage of successful users required three weeks (14%), four weeks (9%) and as long as five weeks (<1%) to experience satisfactory cognitive enhancements. Is Vibratta the right OTC for me? Your daytime energy levels, day-to-day motivation, mental sharpness, ability to focus and pay attention, memory function, and even how much stress you can tolerate are all linked to the way in which you respond to everyday stress factors. Not sure if Vibratta is right for you? Take the 1-minute Vibratta Wellness Quizlet to find out if it's the right addition to your wellness plan. Vibratta Wellness Quizlet is intended for informational purposes only. Do not use quizlet as a substitute for professional medical advice. Always consult with a qualified healthcare practitioner before making changes or additions to your wellness plan. Vibratta is scientifically formulated using a precise balance of active ingredients in dosage ranges determined to be safe and effective through independent clinical evaluation. Current usage statistics show that Vibratta is generally well-tolerated, and adverse reactions are rare. About one-half of one percent (<0.5%) of those who take Vibratta may experience an adverse event. These are typically reported to be mild in intensity. STOP TAKING VIBRATTA IF YOU HAVE AN ADVERSE REACTION. TALK TO YOUR DOCTOR BEFORE TAKING VIBRATTA IF YOU HAVE A HISTORY OF ALLERGIES OR ARE HYPERSENSITIVE TO FOODS OR OTHER OVER-THE-COUNTER PRODUCTS. All reported instances of adverse reactions were transient and resolved quickly once Vibratta use was discontinued. Most adverse events lasted less than 12 hours and not longer than 24 hours. How and When Should I Take Vibratta? 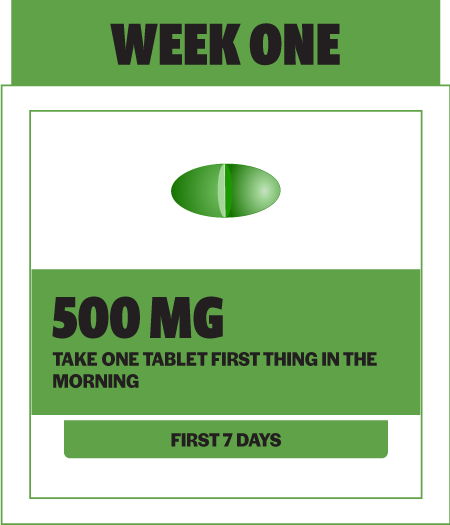 Begin by taking a single Vibratta tablet every morning as a dietary supplement for the first seven days. 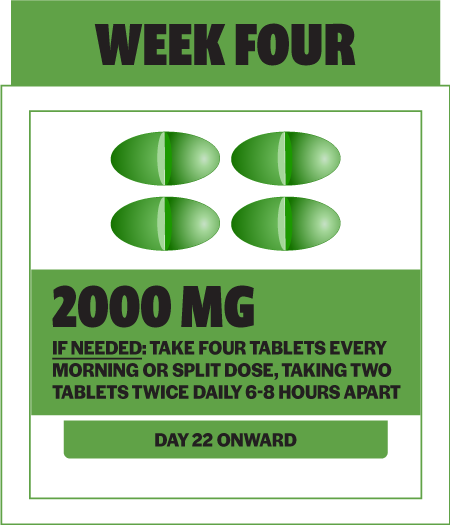 Slowly increase daily intake by one tablet after each week — only if it is needed — up to a maximum of four tablets taken within a 24-hour period. Gradually increasing and moderating Vibratta intake to find the most effective daily amount is called titration. 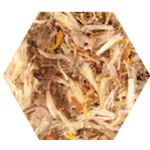 This process ensures that you are taking the right dose of Vibratta, based on your individual response to the formula. Refer to the Vibratta Visual Usage Guidelines below for easy-to-follow instructions before taking Vibratta for the very first time. TAKING MORE THAN THE MAXIMUM DAILY DOSE OF VIBRATTA IS NOT RECOMMENDED AND MAY LEAD TO AN INCREASED POTENTIAL FOR ADVERSE REACTIONS. ALWAYS TAKE VIBRATTA AS DIRECTED FOR BEST RESULTS. You should always take Vibratta as directed for best results. 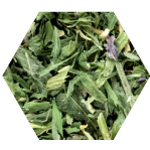 Avoid taking Vibratta too near to bedtime as sleeplessness may occur. Talk to your doctor before making any changes to your current wellness plan. 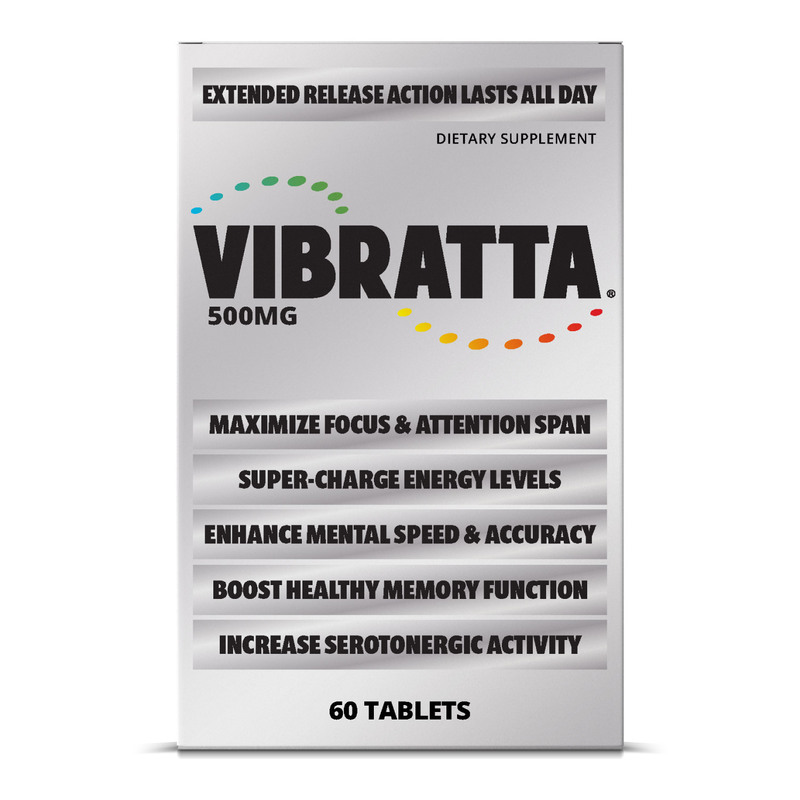 How Much Vibratta Should I Take Daily? How much Vibratta you may need to take daily to achieve a successful result will vary from that of other users, because everybody is unique. Therefore, it make take a little time for you to find the right amount of Vibratta that works best for you. Average daily intake reported by successful Vibratta users indicates a 74% majority used between one tablet (40%) and two tablets (34%) daily to achieve satisfactory results. Refer to the Vibratta Daily Intake Averages chart below to see how many people took a specific amount per day. VISUAL CHART REFERENCE PROVIDED FOR INFORMATIONAL PURPOSES. ONLY SUCCESSFUL USERS WERE SURVEYED TO ESTIMATE AVERAGE DAILY INTAKE. THIS CHART IS NOT MEANT TO PREDICT YOUR INDIVIDUAL RESPONSE TO VIBRATTA. DAILY INTAKE MAY VARY OVER THE COURSE OF USE. A smaller group of users (21%) reported taking up to three tablets daily, and less than five percent (<5%) of users reported taking the maximum daily dose of four Vibratta tablets to achieve satisfactory benefits. People just like you have found life-changing benefits after taking Vibratta for two weeks or longer. 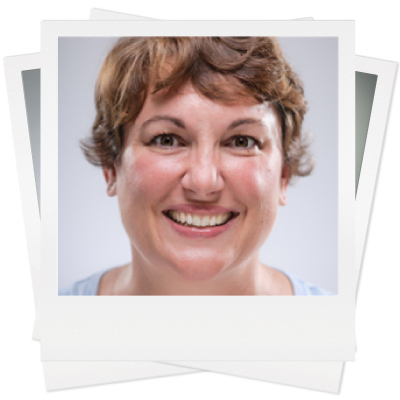 Read on to see how Vibratta has helped others improve their performance at work, home, or school. I began taking this a little over a month ago. After the first week, my stress level melted away to about a third or less of what it was. My concentration tripled! I am a very skeptical person, so I honestly did not believe this product would help me at all. I was wrong and happy to be so. I hope this will convince any of you that have doubts to at least try it. I am so thankful I did! My son and I swear by your products! I've been taking Vibratta during the day and Lunalla at night. I've seen improvement I'm very happy about. My son is on Solamenta. He is like a new person and says he will never go off of it! He also likes the fact that your product is natural. I just wanted to tell you how wonderful it is to find relief in a natural remedy. I used this for one month and gradually increased my dosage. I did not realize how much it was helping until I ran out. I discovered that it really works on my ability to stay focused! 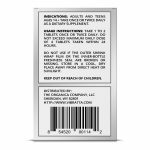 Vibratta is a dietary supplement used to maximize focus and attention span, super-charge energy levels, enhance mental speed and accuracy, improve natural memory ability, and boost serotonergic activity. Is Vibratta Right For Me? Not sure if Vibratta is right for you? Take the 1-minute Vibratta Wellness Quizlet to quickly find out now! 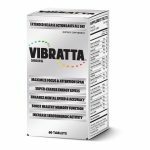 What's In The Vibratta Formula? Vibratta is scientifically formulated using a blend of clinically proven natural stimulants and plant-derived neurotransmitter modulators. 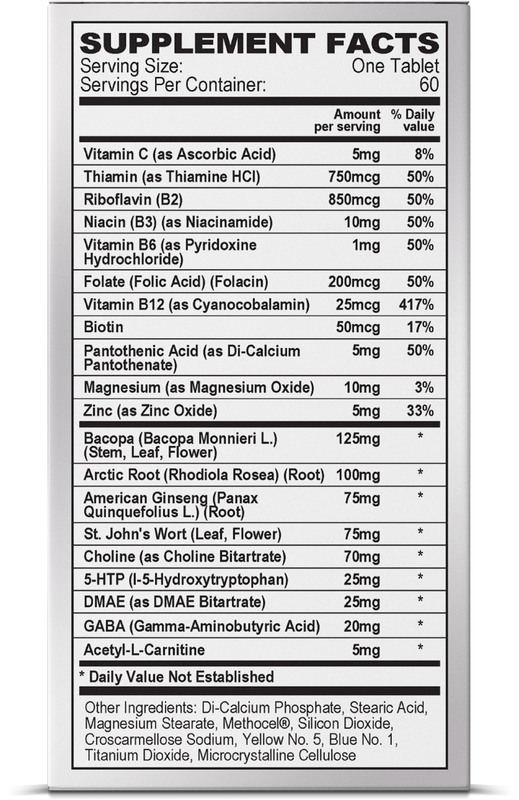 See the full Vibratta active and supporting ingredients list. We’ve engineered Vibratta to work using multiple mechanisms of action, because stress can affect a person in different ways. 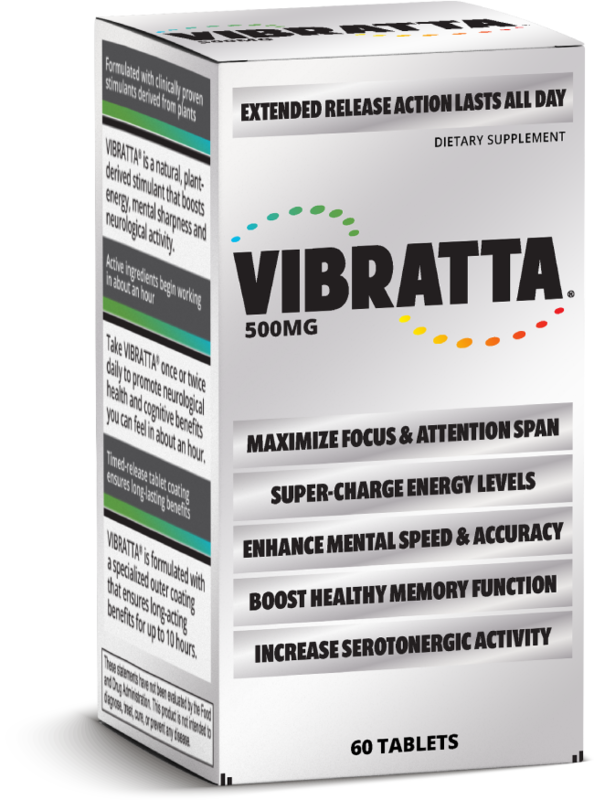 See how Vibratta works to super-charge energy levels and enhance cognitive function. Always use Vibratta as directed. Refer to the Vibratta Visual Usage Guidelines before taking Vibratta for the first time. When Will I See Benefits From Vibratta? 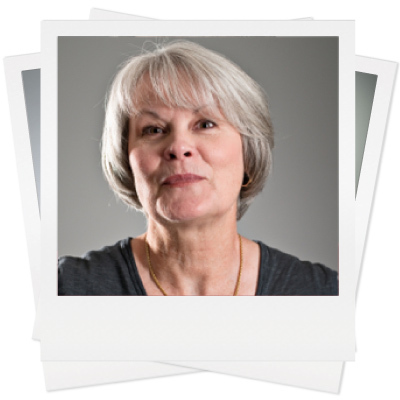 Review the Wide-Scope User Benefits Analysis for average time-to-benefit estimates. 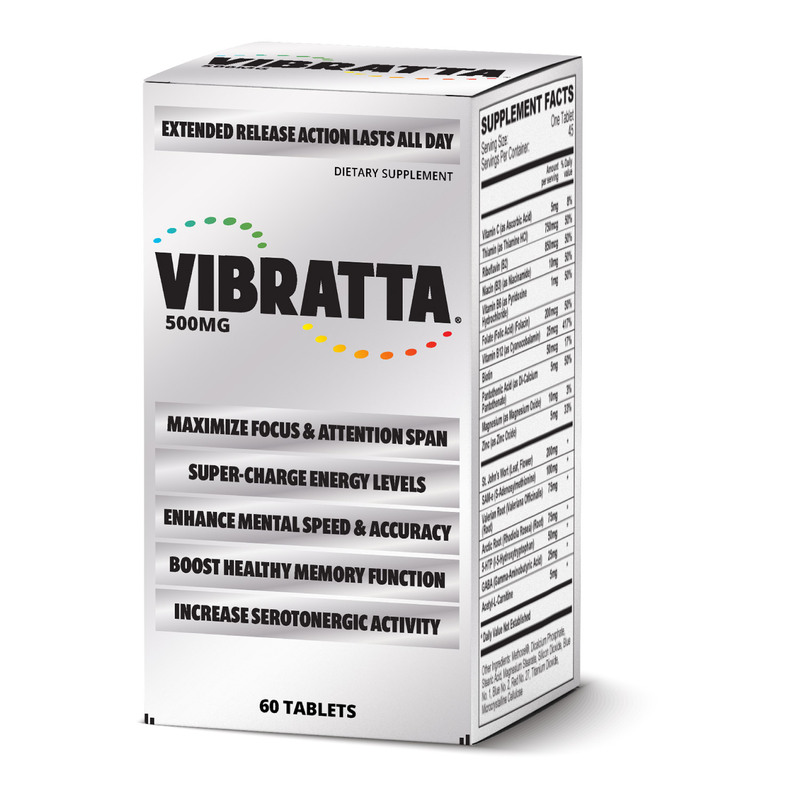 How Long Does Each Vibratta Dose Last? Vibratta tablets are coated using an advanced cellulose polymer technology to ensure that they are broken down slowly and at the right time. Benefits last eight to ten hours per dose on average. 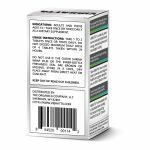 Review the Vibratta Product Safety Report to see how likely it may be to experience an adverse event. Is Vibratta Habit Forming Or Addictive? 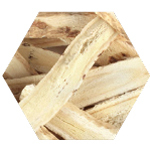 The natural ingredients in Vibratta are non-habit forming and non-addictive. Is Vibratta Approved By The FDA? 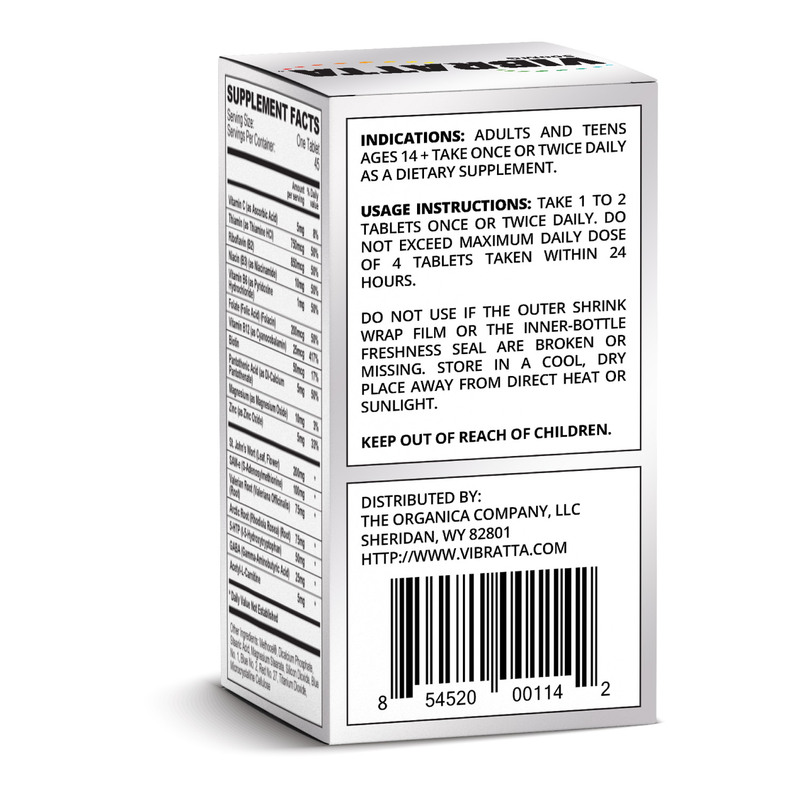 Vibratta is a dietary supplement. It is not approved by the US Food and Drug Administration to diagnose, treat, cure or prevent any disease. Do I Need A Prescription To Take Vibratta? Vibratta does not require a doctor's prescription. But you should always consult with a professional healthcare provider before making changes or additions to your wellness plan. Can I Take Vibratta With Birth Control? Do not take Vibratta if you are taking oral birth control. In rare instances, a decrease in the effectiveness of an oral contraceptive may result if combined with Vibratta. Non-oral forms of birth control remain unaffected when used concurrently with Vibratta. Can I Take Vibratta If I Am Pregnant? Vibratta is not recommended for pregnant women. Do not take Vibratta if you plan on becoming pregnant within the next three months. Can I Take Vibratta While Nursing? Do not take Vibratta if you are nursing. Wait until after your baby is bottle-fed before adding Vibratta to your wellness plan. 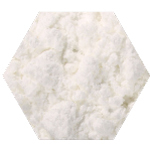 Can I Combine Vibratta With Prescription Drugs? There have been no reports of adverse drug interactions by Vibratta users. This does not mean that an adverse drug interaction cannot occur if you combine Vibratta with a prescribed drug. Always consult with your prescribing doctor before combining Vibratta with any medication you are taking. Can I Take Vibratta Instead Of An rX Drug? 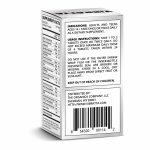 Vibratta is a dietary supplement that is not intended to replace an FDA-approved drug. This is because there is no conclusive scientific evidence to show that dietary supplements are effective replacements for prescribed medications. What Precautions Should I Consider Before Taking Vibratta? 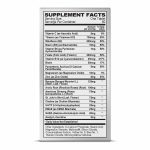 Can I Take Other Supplements With Vibratta? 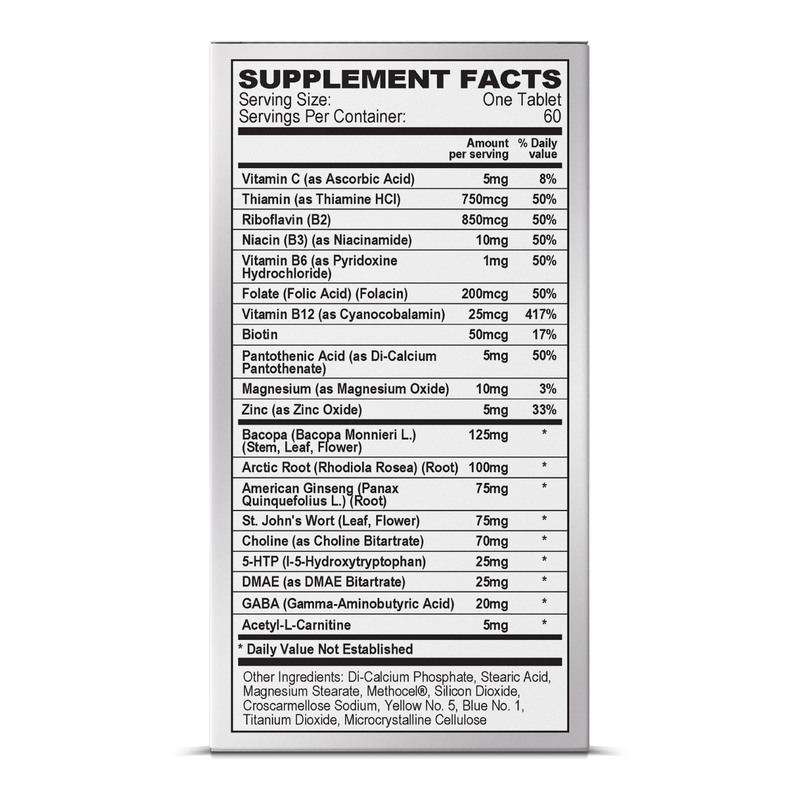 Yes, you may combine Vibratta with any other dietary supplements that you are currently taking. Should I Talk To My Doctor About Vibratta? Yes, you should always speak with your primary healthcare practitioner before taking Vibratta or making any other changes to your wellness plan. This will ensure that you make health changes with adequate medical supervision just incase something should happen for which you need professional advice. It's always best to be safe. What If My Doctor Advises Against Taking Vibratta? 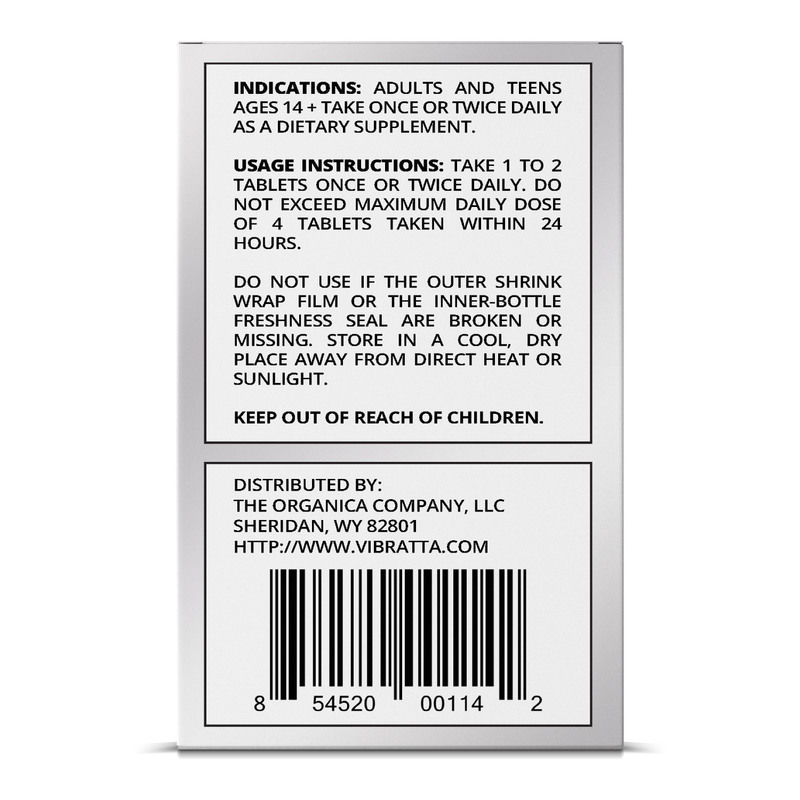 Yes, Vibratta tablets are made using an advanced cellulose polymer technology that contains no animal by-products. Yes, Vibratta is completely gluten free.